HMS Biter is an Archer-class P2000-type patrol and training vessel of the British Royal Navy. She is assigned to Manchester & Salford Universities Royal Naval Unit, a Royal Naval Reserve unit based in Manchester. HMS Biter’s primary task is taking students to sea for weekends in the Irish Sea and for extended periods in UK and foreign waters. The ship is based at HMS Eaglet, the Royal Naval Headquarters in Liverpool. 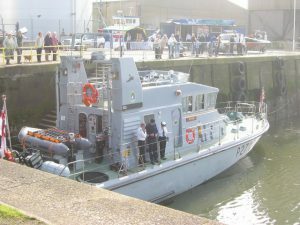 HMS Biter is affiliated to the town of Silloth and has visited the port on a number of occasions over the years. The crew regularly take part in the annual Remembrance Sunday commemorations at Christ Church for which the town are very grateful.